Alternative R&B recording and performing artist Gunner Jules Krogman (Sicangu Lakota) writes, sings, raps, and produces original music. He performs and speaks widely, while also collaborating with other artists, including Tanaya Winder and Rollie Raps. He was recently featured in the music video “Good Way” by Frank Waln. Gunner is a Dream Warriors artist and 2017 First Peoples Fund Artist in Business Leadership fellow. Trying to make a grade in high school with piano, Gunner changed to making beats on a computer instead. He started singing, rapping, and hoping. That hope became his dream. The dream turned into a vision. That vision is becoming reality. Growing up on the Rosebud Sioux Reservation in South Dakota, the music scene was non-existent for Gunner. What listeners hear of his music comes from years of teaching himself. He creates stories through his songs, even tragic stories. But he stays true to his values, keeping in mind his desire to be a positive example. 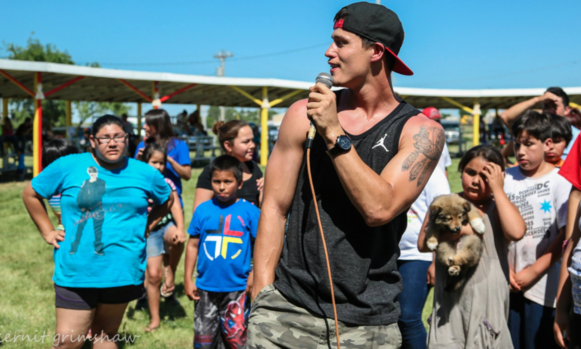 He performs at youth-centered events like the Black Hills Powwow Youth Day and, recently, the Standing Rock Youth Empowerment Summit. Gunner tells youth his story through songs, being that role model they can see who is chasing a dream. Gunner is focused on producing his first album, tentatively titled U R U.
Gunner’s First Peoples Fund fellowship covered much of his equipment upgrade expenses, and travel for building connections in places like Toronto and New York while he prepares to market his upcoming album. Native Hope in Chamberlain, South Dakota, funded the purchase of a new laptop for him to keep up with business work while on the road. A decade past trying to make a high school grade, Gunner is showing youth it is possible to accomplish your dreams while staying true to your morals and beliefs. This philosophy has brought him a long way, and proved that hope can indeed become reality.